How to get there: Locate Hwy. 7 connecting from Hønefoss to Gol and Geilo. Just north of the lake Krøderen is the small community Gulsvik. There is a road going south (left if you arrive from the south), with a yellow sign saying Veteren 7, and a white sign saying Høgevarde 12 (these signs are on Hwy. 7, which is going east-west just here). Take this road south as it runs on the west side of lake Gulsviktjernet. Measure from this turnoff. After 1.7 kilometer, leave the paved road and take a dirt road that forks right. There is a roadsign here saying Høgevarde 10. At kilometer 2 (that is 300 meter up the dirt road), there is a toll collection station. In 2006, the toll was NOK 50. It can be paid with coins or with a credit card. Continue along the main road as it winds uphill (ignore small side roads) to kilometer 10.7. This is a T-junction with a huge sign saying "Høgevarde Hytteområde" right in front of you. Turn left and stay at the main road as it turns left just as it starts to climb (ignore a smaller road going straight/right). There is a sign saying Gulsviksetra, follow this. At kilometer 12.6, fork right as the main road continues uphill. Again, follow the sign saying Gulsviksetra. At kilometer 13.4, you cross a creek on a concrete bridge, then at kilometer 13.8, there is a second bridge made of wood. Immediately after crossing this bridge, make a right turn and continue uphill for about 100 meter. There is a turnout that can serve one car on your left hand side. This is the trailhead, park here at location N60:19.195, E009:28.013, elevation 920 meter. The road continues higher, serving three mountain cabins, but there is no adequate parking higher. If the suggested spot is taken, return downhill and locate suitable parking there. Route description: I hiked this mountain in rain and fog with very little visibility. However, the route is likely to be about the same. The terrain in this area is extremely nice and one can walk with little effort almost anywhere. Continue up the small road to its very end. You are now at the third mountain cabin. The trail is marked with red "T" as it heads out on the right corner of the cabin, just next to its wall. This trail is easy to follow as it runs uphill just left of the creek. Higher up, the trail continues uphill, but slightly further away from the creek. Before the trail enters the ridge that will take you directly to the best known summit, Høgevarde, 1459m, just 7 meter short of being the highest, leave the trail and proceed south-west in the direction of the summit Ranten (1419m). You will reconnect with a new T-marked trail. Continue right on this trail as it contours around Ranten. As this trail enters a more level area on the north side of Ranten, leave the trail (going right) and proceed to the north-west. You may visit the subsidiary point 1430 along the way, or bypass it on either side. The final slope up on Gråfjell is quite distinct, but never difficult. Climb it and arrive at a very impressive and well built cairn. Comments: I was returning to Bergen from Oslo and wondered if there was a "small hike" I could do along the way. Gråfjell seemed like a good choice. My very first ski trip to a significant summit with my father had climbed the nearby Høgevarde already in 1962. The weather was pouring rain, and I realized that this would be a wet hike. I drove to the trailhead, arriving around 1045. Even with the fog, limited visibility and rain, I immediately noticed the very nice mountain cabins in the area. Obviously, quite a large number' of cabins are being built. The terrain is perfect for skiing and the disatnce to Oslo not too great, no wonder that this is a popular place. I needed a set of dry clothes for driving to Bergen, and since my choices were limited, ended up taking my fleece and (rain)jacket plus a pair of Lewis jeans. Obviously, this would be an exercise in orienteering. I did not bring the map for this area, but did have a map on my laptop, however no cable for a GPS download. A brief look produced a strategy: Follow the trail to about 1240, then walk south-west until you hit a second trail. Follow this trail for about 1 kilometer, then head north-west until you bump into the mountain. Finally, hike uphill until you hit the summit cairn. Easy to remember, I set out shortly before 1100, in pouring rain equipped with a compass and my GPS. I decided to leave camera as well as my backpack in the car, anything taken along would most likely, get very wet indeed. The first part was easy, I left the trail and the crossing to the second trail went according to plan. I knew that I would get pretty close to a mountain called Ranten (1419m), however, I never saw any trace of it due to the fog. I hiked along the new trail and noticed a slope (down) on my right that I did not quite recall. First, I thought I should follow the trail until this slope ended, however after about one kilometer, I switched to my north-west direction. This quickly got me into terrain above 1400 meter (according to my GPS), but as is often the case in fog, small hills look like big mountains and not unexpectedly, I ended up at the 1430 summit just south-east of Gråfjell. I was slightly confused for a moment, as I seemed to only remember a 1410 hill along my course (poor map reading) and my GPS showed 1440. In the fog, to continue north-west did not look very promising. However, upon checking my travel distance from the trail, I realized that my goal had to be further away. I carefully descended what initially appeared as steep cliffs, then continued across to the base of Gråfjell. The slope extended directly into the clouds, and I quickly realized that this peak had to be my goal for the day. A very big, well built cairn with a visitor's trail register welcomed me at the top. The wind was gale force and the rain was slamming into everything here at the summit. I took the trail register to the sheltered side of the cairn, signed in and put it securely back in its case. The time was 1310, the climb had taken about 2:15. This was no place to hang around and I started my return hike, retracing the route of ascent. My Lewis was now about 5 kilogram of water. The lesson (that I already knew! ), is never go hiking in the mountains with jeans. Worse, after taking "a leak", my fingers were too cold to reattach the buttons. I was not freezing in any way, however the fine, but strong movements that were required were difficult to complete. I laughed of this and continued downhill holding on to my wet, extra 5 kilogram pants, reminding myself to never, never, go hiking with such a stupid garment. I reached the car at 1430, totally soaked, but very refreshed for a continuation of my drive back to Bergen. 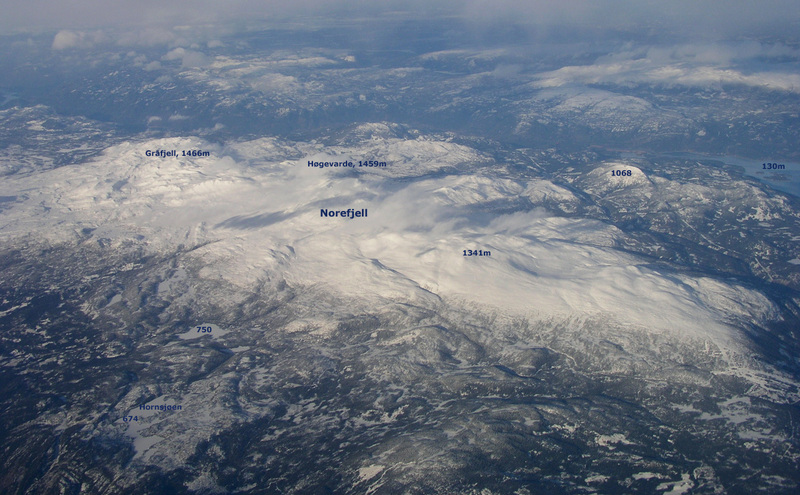 Gråfjell, as seen from the air February 10. 2005.